China's newly announced "Polar Silk Road" evokes the memory of President Vladimir Putin's remark about the possibility to link the Beijing-led One Belt One Road project with Russia's Northern Sea Route, which is likely to become one of major trade routes connecting Asia and Europe, RIA Novosti contributor Dmitry Lekukh writes. "The Chinese government hereby issues this white paper, to expound its basic positions on Arctic affairs, to elaborate on its policy goals, basic principles and major policies and positions regarding its engagement in Arctic affairs, to guide relevant Chinese government departments and institutions in Arctic-related activities and cooperation, to encourage relevant parties to get better involved in Arctic governance, and to work with the international community to safeguard and promote peace and stability in, and the sustainable development of, the Arctic," China's Arctic Policy white paper, which was released on January 26, reads. The journalist argued that Russia's northern route, which goes along Russia's Arctic and Far East regions, corresponds best to Beijing's geopolitical interests and security. Lekukh drew attention to the fact that the trade route through the Suez Canal and the Mediterranean is overburdened. Moreover, the Middle East still remains a hotbed of instability. Another potential route running through Central America — either the existing Panama or the hypothetical Nicaraguan canal — doesn't meet Beijing's need to bolster ties between Europe and Asia, the journalist noted. According to Lekukh, only two polar routes could be of a truly strategic, long-term interest for China: the Northwest Passage, which runs along the northern coast of North America; and Russia's Northern Sea Route, which appears to be "far more attractive" for the Chinese, as the first lane goes through the territorial waters of Beijing's geopolitical competitors, the US and its ally, Canada. 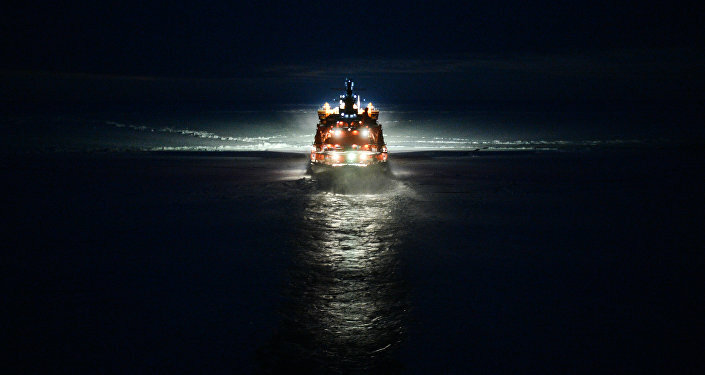 "For [Russia], China's active participation in the development of the Northern Sea Route is attractive not only because of potential investments [into Russia's economy on the part of Beijing]," the journalist explained, "For us, the Chinese could be of particular interest as constant 'purchasers of services'… And it's absolutely logical because the Japanese, Koreans, Vietnamese and the countries of the European Union will be also interested in [Russia's] Northern Sea Route 'services'." However, it's beyond doubt that China will become the "transit wholesaler" on the NSR, Lekukh highlighted. Meanwhile, China's sphere of interest in the Arctic also includes the joint exploration of the region's natural resources with the Russian Federation; while Moscow, for its part, is vitally interested in Beijing's helping hand developing the Arctic infrastructure, the RIA Novosti contributor assumed. "It is a very good sign that the authorities of the Russian Federation and the People's Republic of China have approximately the same vision for the need to cooperate on the development of this [Arctic] region. Neighborliness and common interests are the best way to establish cooperation, and not only in the 'Arctic areas'," the journalist underscored, admitting, however, that it will take time and effort to implement the mutually beneficial Sino-Russian project. The views and opinions expressed by Dmitry Lekukh are those of the analyst and do not necessarily reflect those of Sputnik.